Buy your first apartment building. Manage the building for long-term growth. Within 10 years, buy your next apartment building. It’s simple, but that does not mean it’s easy. Property management is a lot of work if it’s done right and when it requires your full attention it’s a full-time job on top of whatever other career and family obligations you have in your life. That’s why rental property owners have been paying property management companies to manage their buildings since 70’s when it became more mainstream. The good news is that you can absolutely build wealth through rental property investment and I am going to show you how. The key aspect of my wealth-building plan is leveraging the equity in your first building to purchase a second apartment building within a 10-year time frame. “Leveraging your equity” means you get to buy a second building by using the appreciation in value from the first building as your down payment for the second. You’re not saving money from your job or from your cash flow on the first building to buy the second property, you’re getting that money from the bank with no out of pocket cost to you. Sounds good, doesn’t it? By the time you’ve bought two buildings in 10 years, you are well on your way to financial success and security through your real estate investments. You can count on two successful buildings to provide cash flow, or an extra “salary” for you. You’ll notice I have up to a 10-year timetable for this plan. In my plan, we invest in the long term. This is a “get rich slow” plan, not a “get rich quick” scheme. What kind of property you going to buy? How much of a down payment do you have to invest? What kinds of assets can you identify that are underutilized and can be exploited to make you money? This process is more similar to identifying the next superstar musical talent for a record deal than simply shopping in the store. It’s always possible to find a good investment but it’s not easy and it can take time and effort. This phase is very important and it can make or break the deal. Your real estate agent will help you make sure your questions about the property are satisfactorily answered before you close escrow and the money and building change hands. Your first step in focusing your search is to find a good agent. Look for someone who has extensive experience and knowledge of the market in which you’re searching. Someone you feel comfortable talking and working with because you’re going to spend a lot of time together in person, on the phone, and over email as you go through the phases of this process. Start to build your team, real estate agent, real estate lawyer or title company, CPA for tax advice, loan officer (banks), contractors, and management company. The big question: how much are you going to be able to invest? My best advice is to have at least 30-40% equity from day one. For example, if you’re buying a building worth $2,000,000 you need to have between $600,000 and $800,000 in cash as your down payment. You can buy a decent two to four-unit apartment building in San Francisco for between $1,500,000 and $2,000,000. By investing with a 30-40% down payment you should be able to buy a property that produces positive cash flow, or your “second salary” from day one. Don’t buy a building that doesn’t produce positive cash flow from day one. Taking care of this building is a job; you wouldn’t go to work every day for free, just for the chance to “build equity” in your company. That would get old really fast, wouldn’t it? The same holds true here: don’t own and manage a real estate investment without getting a return on that investment. When it comes time to focus your search make sure you expand your range beyond the maximum price of a building that you could buy. For example, if you have $500,000 to invest and you want to make sure you make at least a 30% down payment the most expensive building you could buy would be $1,500,000. Even so, don’t just look at buildings priced below $1,500,000 because you could find a building priced at $1,750,000 that’s overpriced and has been sitting on the market for a long time. This kind of building could potentially be negotiated into your price range if you find a buyer who’s willing to settle for a lower price. 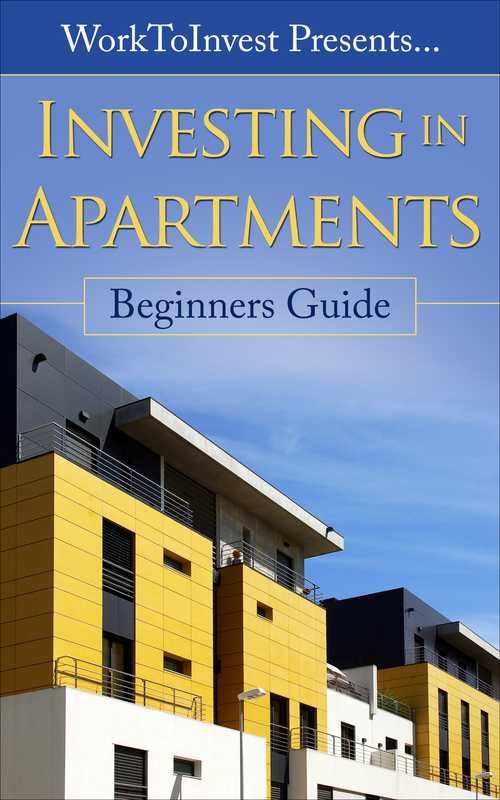 The smart apartment investor looks at a wide variety of possibilities to find the right one. Finally, once you’ve set your price range, you get ready to go out and visit properties in person. You’re going to spend a lot of time walking through buildings so get prepare yourself and allow ample time to find a good fit. You’re going to see lots of interesting spaces. Some will be well designed and others will be funky and weird. Some will be old and tired and others will be newly renovated and look sharp and attractive. This is why I use the word “scouting” instead of “shopping” or “searching.” This process is strategic. Depending on the market you may never be able to see all of the properties that are available for sale before more come available and you have to start over again. In some very competitive markets there may only be a few buildings available and you may have to wait for the right opportunity to present itself to you. You never know when a property you thought was out of reach will become available. There’s a lot of opportunity out there and it’s your job to throw away all of the crap, to throw away all of the buildings that are no good and get started looking for that one true superstar. The Tom Brady in the 6th round of the draft, the Michael Jackson that’s going to be a super star for you as an apartment building investment. This plan is a comprehensive process. You make your money when you buy a building, not when you sell. This is why I recommend spending a lot of time on this process. Get comfortable with it because the better the price you get from the beginning the higher your cash flow will be and the better your “starting salary” will be with this new job you’re taking on. You lock in your profit over the long run by buying well not by selling your property. The day you sell can be a good day to harvest your profits but it’s also the end of your equity appreciation and your monthly salary checks from this job so the day you sell isn’t nearly as important as the day you buy. This process can take you six months to a year of going out once a week or on the weekends trying to find that right building, getting to know when you walk into a “good building” as opposed to how it feels when you walk into a building that doesn’t feel so good. You may miss opportunities early on; don’t feel bad about that. It’s part of your education in finding that right building that will make you $1,000,000 in 14 years and plenty of cash flow to support your lifestyle along the way. Part of the market preparation, in addition to going out and actually looking at buildings that are for sale, is going out and understanding what neighborhoods are like. You need to know your market. If you’re looking in San Francisco, you need to know: Why do people to want to live in particular neighborhoods more than others? Your customers are going to be tenants, people with good jobs who are going to want to live in your building. Where are they working and how easy is it for them to get to work every day? Another crucial part of your education is to know the market rates for apartments in the markets in which you’re interested in buying an apartment building. Take a look at apartment listings online to see what kinds of rents people are asking for different kinds of apartments. Take note of the amenities that are included in one apartment that makes it more expensive than another. For example, an apartment with laundry in the unit and a garage parking space is going to rent for more than one in a building with coin operated laundry and no parking or a Laundromat at the end of the block. Tenants pay more for apartments that offer those amenities and conveniences. One of the things I like to do, and this is probably just because I’m an apartment investment nerd and I get a kick out of this, is visit apartment open houses. I go to a neighborhood that I’m interested in, have coffee, have brunch and then follow those A-frame signs that the agents put out for homes and condos and buildings for sale or apartments for rent. Clearly I’m not going to be renting anything but as an investor it’s great to get a feeling for how other people see the market. Take advantage of other people’s knowledge and experience and get a feeling for what they think their apartments are worth. Spend some time, be patient, get to know your market well. This is not a speculative game. You will make money if you buy and manage your building well. If a building is overpriced this is typically because the seller either doesn’t understand the market or knows the property has untapped potential and wants to sell you potential instead of reliable income. For example, if seller has apartments that are renting for two thirds of the maximum potential market rent it doesn’t make sense for the property to be priced as if the units are earning that maximum potential market rent. Even if all a buyer would have to do is raise the rents with a rent increase notice this is a property management strategy that adds value to the building. Without completing this rent increase process the building is worth what it produces with tenants paying two thirds of market rent, not full market rent. The seller cannot expect to earn top dollar and you should not be willing to pay top dollar for this building. Validate the rents as they currently stand, don’t speculate on what the rents could possibly be. Secret #2: Validate, Don’t Speculate! Let’s say you’ve done your homework, you know what market rents are in the area where you’re shopping and you are comparing two different buildings. You’ve visited them both, you’ve seen the units and examined the rents. One building has several units with tenants who are still under lease and who moved in less than a year ago and their rents are higher than you’ve seen similar units get in the same area. The other building has several units with tenants who are still under lease and who moved in less than a year ago and their rents are lower than you’ve seen similar units get in the same area. Which building should you consider buying? Let’s compare. If you buy the building with the above-market rents and you pay a reasonable price for that building based on the above-market rents you could be in trouble when the leases expire and the tenants move out, especially if you have trouble getting that same rent once again. Your income will drop, your mortgage and other expenses stay the same and, as a result, your profit shrinks. This means you just took a pay cut from your investment, your “second job” as an apartment investor, and things are tight. If you buy the second building, the one with the below-market rents, and you pay a reasonable price based on these actual rents, you could find yourself in a good position as the units turn over. If you’re able to increase your rents to what you know the market will bear then your income increases while the rest of your expenses stay the same. As a result you get a pay increase from your investment, your “second job” as an apartment investor, and you’re enjoying better cash flow and improved property value. How do you get information on income and expenses? It’s easy: sellers are required to disclose income and expenses to you as part of the “disclosure package” that is made available as a part of the sale. This disclosure package will include a “rent roll,” or a list of all of the current apartments, the names of the tenants, the date they moved in to the building, how much they paid in security deposits when they moved in, and any other charges the tenants pay to the landlord every month. This is your income. This is why the building has any value at all, because of these agreements that tenants will pay to live in the property. Apartment buildings aren’t houses. Their value is not based solely on what other people will pay to buy them. This is certainly part of the equation but it’s deeper than that. The value of apartment buildings is also based on how the rents a building owner could collect and the expenses they’ll have to pay to collect those rents. A building that has below-market rents harbors an opportunity to take advantage of the potential to increase rents to market. Nevertheless, a Smart Apartment Investor won’t pay more for the building than the value of its current rents just to get access to this opportunity. A Smart Apartment Investor buys a building based on the value of current rents and then captures the increase in value as their reward for being smart and applying skill and hard work to create a successful investment. Economizing on expenses is a great way to increase your return on investment without increasing rents. For example, if you see in the disclosure package that the current owner is paying for trash service that comes every day but the trash cans aren’t full every day you can talk to the garbage company and have them tell you the recommended service level for a building of that size. It’s not in their best interest to pro-actively offer their customers less service but if you ask them they’ll tell you you can get by with less frequent service, thereby saving yourself on this expense. A penny saved is a penny earned! I have done this for my own properties and for my clients and it’s a great strategy for increasing your net income. As a property manager I have access to my clients’ expense records showing what it cost to operate their buildings. Without compromising my clients’ confidentiality I can use this data to accurately project how much an eight unit apartment building should pay for trash service, insurance, or any other expense and recognize these inconsistencies in buildings being offered for sale. Conversely, sometimes a seller or their agent can under-report certain expenses thereby making their building seem more profitable than it really is. Once you get your income and expenses, you can calculate your net operating income. This is a crucial detail for evaluating pricing and profitability of an apartment building investment. Begin by taking your Gross Scheduled Rent, or all rents that are due to be paid each month plus a reasonable guess at market rent for any vacant units, and multiply this by 12 months. A Vacancy Factor helps you anticipate turnover costs. Turnover is when your tenants move out and you go through the process of replacing them. To discover your Vacancy Factor, subtract a vacancy factor of two to five percent. This represents the cost of having a unit vacant between tenants. If you’re confident in your ability to find new tenants and generate market rents quickly then go with the lower end of the spectrum, two percent; if you’re new and want to make sure you’ll still make money even if a vacancy takes a little longer to rent then go with the five percent vacancy factor. Gross scheduled rent minus Vacancy Factor gives you your Effective Rental Income. Next you deduct all of your operating expenses, those cash expenses that are required to operate the building effectively and command market rents. Operating expenses include property taxes, insurance, property management fees, utilities, janitorial service, and the like. Effective rental income minus operating expenses equals Net Operating Income or NOI. Let’s figure out what your profit will be from your apartment building investment. NOI is what you’re going to use to pay the mortgage every month because you’re not going to buy a building with 100% cash. We’ll discuss why later on, but suffice to say that buying buildings with all cash isn’t a tool in a Smart Apartment Investor’s toolbox. To figure out what your profit is going to be each month you have to find out how much it’s going to cost to borrow the rest of your capital. Get a referral to a loan broker or a banker who makes commercial and residential loans. Get a sense of market interest rates for the amount you’re looking to borrow and go online to find a loan amortization calculator. Entering your loan amount, a reasonable market interest rate, and setting it for a fully amortized 30-year loan will give you the amount of your monthly payment. If you subtract this from your monthly NOI you’ll see if the investment will be cash flow positive from day one, whether it’ll pay you a “second salary” or it’ll cost you money. Never buy a building that doesn’t make some money from day one. Some people reason that the building will grow in value in a few years because market prices are increasing so they’ll tolerate a break-even investment. This is not how a Smart Apartment Investor buys a building. Two more important tools for analyzing an apartment building’s return on investment and pricing are the capitalization rate and gross rent multiplier. Capitalization Rate, or “cap rate” is essentially the return on investment you’d get if you bought the building with all cash. As Smart Apartment Investors we don’t buy buildings with all cash, but it’s important to know that Cap Rates tell you the building’s ability to pay for itself by returning your initial capital investment to you over time. The formula for capitalization rate is simply net operating income divided by purchase price. A higher cap rate means you have a higher net operating income or a lower purchase price. A lower cap rate means lower net operating income or higher purchase price. Cap rates can vary from a negative number to ten percent or more. The higher your cap rate the better a job you did buying and operating your building. As you increase your income or eliminate your expenses you can increase your cap rate because your purchase price stays the same. Your cap rate considers your expenses so it’s a good measure of profitability. You want to buy buildings at a higher cap rate but be sure to examine income and expense numbers thoroughly to make sure they’re represented reasonably before you accept that a building with a higher cap rate is a better opportunity to buy. For example, if an expense has been under-reported in the disclosure package this means that NOI is higher and therefore cap rates are higher. When you buy this building you could find that you need to spend more for this under-reported expense and you’ll have a lower NOI and a lower cap rate. The Gross Rent Multiplier (GRM) is simply the purchase price divided by the gross scheduled rents. It doesn’t speak directly to your return on investment but rather gives you an easy way to compare one building to another with regard to price and its relation to gross income. GRM doesn’t consider expenses so it’s not a measure of profitability. You typically want to buy a building with a lower GRM because that means it’s priced lower. It takes time to get good at looking at these numbers and calculating cap rates, GRMs, and understanding NOI. The more buildings you analyze the better you’ll get at recognizing something fishy in the numbers. You’ll say, “Well, that cap rate looks a little funky. Why would anyone price their building as a 12% cap rate in a market where properties are routinely selling at 6% cap rates?” If you see this, dig into the numbers and visit the property to find out why it’s priced so low. Now we’ve covered focusing and the scouting process. Once you’ve worked the numbers and you think you’ve found a building you want to buy you have to decide if you want to proceed. Here’s where the negotiations start. It’s time to make an offer. On one hand, making an offer is a big deal but on the other hand, it’s really not. It’s a big deal because you’re telling someone, “I want to buy your property” and you’re required to put down a deposit of around 3% of the offering price to show you mean it. If you don’t perform you could lose your deposit! It’s not such a big deal because you can insert contingencies into your contract that allow you to cancel the contract before it goes through and recover your deposit. Your agent will recommend that you put contingencies in your contract related to the condition of the property (an inspection contingency), a contingency related to your ability to obtain financing at specified terms (a financing contingency), or that it appraises at a specified price (an appraisal contingency). Any of these conditions gives you the opportunity to back out of the deal and cancel the contract if you find that the property isn’t what you’d hoped or you are otherwise unable or unwilling to complete the deal. My favorite way to think of contingencies is with this example: let’s imagine you pull out a piece of paper and you write on the paper right now, “I hereby promise in this legally binding contract to give one million dollars to J.J. Panzer of the Real Management Company next Friday” and then you sign it at the bottom and have it notarized. You’ve just promised to give me one million dollars! Thanks! Would you do that? Probably not. Now, if you amend the contract before you sign it and write, “Unless I change my mind,” at the very end. How would you feel about signing that? Pretty good, right? All week long you’ll tell me, “I’m going to pay you that million dollars on Friday” and then when Friday rolls around you say, “Never mind. I changed my mind.” That’s essentially how the purchase contract works. You promise to pay a specified price until a certain time and you’re free to change your mind at any point up until that time arrives. There are myriad contingencies in a purchase contract, but your inspection contingency is one of the most important. For me, inspecting an apartment building is a bit like a nature walk. Imagine you’re walking through the woods and you find some mushrooms that look pretty good. Are you going to eat them? Unless you’re a Mycologist and you have extensive knowledge of what kinds of mushrooms are safe to eat you’re not likely to take this chance. An inspection period is like being on a nature accompanied by the Park Ranger who knows everything about the forest, in applying this idea to a property inspection, the general contractor or a structural engineer is like the knowledgeable Park Ranger and when it comes to understanding what makes a structurally sound property, these experts can help you to determine everything from whether dry rot on stairs or a stain on the ceiling could be indicative of an expensive problem or an issue that’s simple to fix. These experts are there to guide you in making sure you don’t get sick from investing in a poisonous property.